Western New York village located on the Erie Canal still shows the commercial importance of that waterway via several businesses located alongside: a planing mill, grist mill, canning factory, and a baking powder manufacturer. Two railroad lines appear, however--the dominant form of transportation by the 1880s--and eventually the village of 2,000 became better known as a suburb of Rochester and its canal a scenic pathway. Burleigh, L. R. (Lucien R.), 1853?-1923. Beck & Pauli. 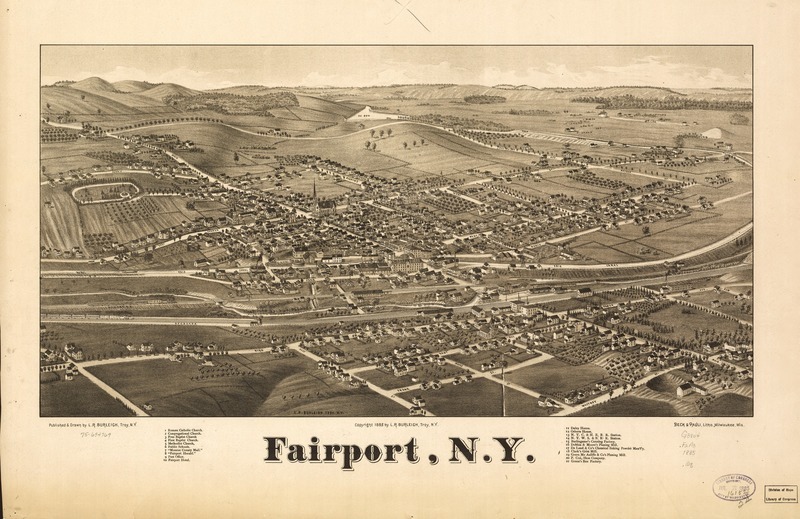 , “Fairport, NY, 1885,” OpenValley, accessed April 25, 2019, https://openvalley.org/items/show/897.